The Epiphone PRO-1 Performance Pack offers you everything for a successful entry into the world of the electric guitar. In addition to an electric guitar specially designed for easy access to all layers, the PRO-1 Performance Pack delivers a 3 Watt MityPRO mini amplifier including cable, guitar strap and picks. Last but not least, the set includes a Rocksmith Tone Cable for USB connection to PCs and Macs and a free download code for the Rocksmith 2014 Edition for PC and Mac to get started with the first riffs! Epiphones PRO-1 Explorer with extra wide cutaway for playing in the high positions. 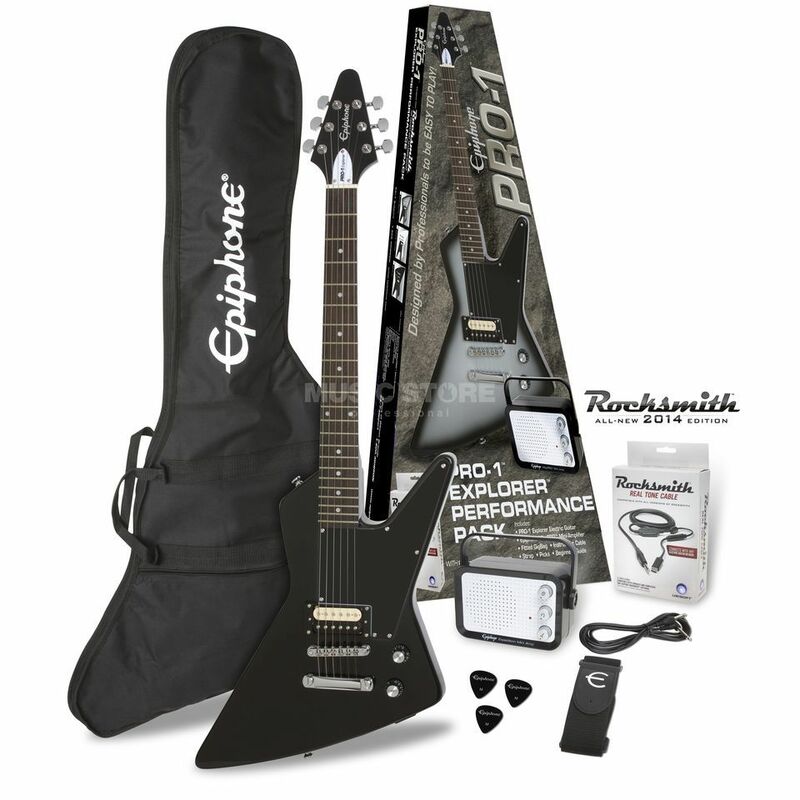 The Epiphone PRO-1 Explorer in Ebony finish with extra wide cutaway. As a classic of the electric guitar, the Explorer has been the flagship of hard rock and metal for several decades now. Metallicas James Hetfield, Trivium's Matt Heafy and even Eric Clapton made the eccentric body design on stage immortal. Thanks to an extra-wide cutaway, the PRO-1 Explorer now offers easy access to the high positions of the fingerboard, while an Epiphone 700T ceramic humbucker provides convincing sound arguments.